The May issue of CQ is a contester's dream (but don't worry if that isn't you!) 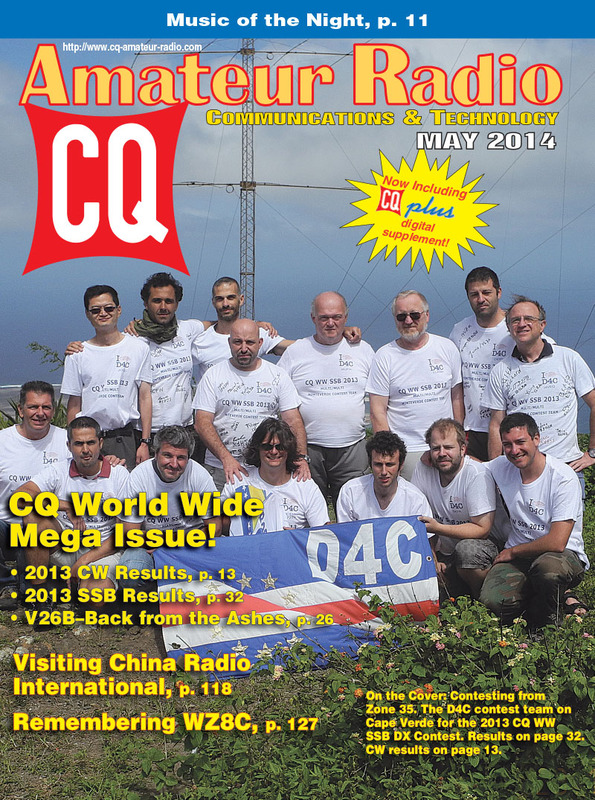 - we've got results of both the SSB and CW weekends of the 2013 CQ World Wide DX Contest, plus a story of the phoenix-like return to the air of Caribbean contest station V26B after a devastating fire. Please note: as we have been doing for the past year, the station-by-station contest "line scores" are now online only, here on the CQ website. Click here for the complete SSB scores or click here for the complete CW scores. For a completely different type of competition, we invite you to "Give Foxhunting a Try in 2014," as part of the CQ World Wide Foxhunting Weekend this month, described by moderator Joe Moell, K0OV. If contesting is not your "thing" (or even if it is), be sure to check out W4DNN's tale of building up his code skills by tuning in CW signals at bedtime and being lulled to sleep by "The Music of the Night." In this month's columns, “Math’s Notes” editor Irwin Math, WA2NDM, takes us on "A Visit to a Local Treasure Chest;" Public Service Editor Richard Fisher, KI6SN, reports on ham radio's response to historic snow and ice storms last winter in Slovenia; QRP Editor Cam Hartford, N6GA, shows us how to get "the most out of the least;" and Kit-Building Editor Joe Eisenberg, K0NEB, explores the new homes found for the popular Rock-Mite and Freq-Mite kits after the closing of Small Wonder Labs late last year. "Magic in the Sky" editor Jeff Reinhardt, AA6JR, laments the disappearance of radios you can fix yourself in "They Don't Make 'em Like They Used To;" Antennas Editor Kent Britain, WA5VJB, discusses "The Care and Feeding of SWRs" (a topic he would have covered in April except that his column isn't scheduled to run in that issue); Digital Editor Don Rotolo, N2IRZ, looks at "DVRPTR V1" or "D-STAR on a Budget," and International Editor Tom Smerk, AA6TS, explores growth in radio clubs and band access around the world. "Learning Curve" editor Ron Ochu, KO0Z, offers "A Primer on Where and When to Listen on VHF/UHF," and CQ Editor Rich Moseson, W2VU, picks up this month's "VHF Plus" column, discussing CQ's role as "A Voice for VHF" and introducing our new VHF Editor, Tony Emanuele, WA8RJF, whose first column will appear in the June issue. Awards Editor Ted Melinosky, K1BV, looks at awards from Norway, Sweden and Indonesia; DX Editor Wayne Mills, N7NG, analyzes the pileups on the FT5ZM DXpedition to Amsterdam Island in the Indian Ocean; and Contesting Editor George Tranos, N2GA, reports on the ARRL's traveling W1AW/x special event stations (he was a W1AW/2 operator) and how they relate to contesting. Finally, Propagation Editor Tomas Hood, NW7US, holds out "Higher Frequency Hope" for improved conditions on the upper HF bands in May. Meanwhile, in CQ Plus, our monthly supplement to the digital edition of CQ, Richard Weil, KWØU, takes readers for a rare inside look at China Radio International’s facilities near Beijing. The trip was his reward for being a contest winner, compliments of the legendary shortwave giant. We also have a remembrance of Nancy Kott, WZ8C (SK), by Morse Code columnist Randy Noon, KCØCCR, following her recent passing. The former WorldRadio and WorldRadio Online editor will be remembered as the “First Lady of CW” – the motivational force behind the Morse preservation society FISTS in the United States. Ever wondered what it would be like to do FM broadcast band DXing from inside an airliner? Joe Eisenberg, KØNEB, did, and recently filled his log on flights between Nebraska and San Diego. You’ll not want to miss his observations on the fascinating FM reception at 35,000 feet. Veteran SWLer Gerry Dexter, WPC9GLD, fills in listeners on the lastest news from the HF bands. We’ll have to take some good news with the not-so-good, he writes. This month, CQ Plus kicks off the new monthly column, “Disaster DXing.” Mehmet Burk takes readers around the world to regions facing natural disasters. There are lots of audio links and recommendations for tuning into the action from your listening post. Radio "foxhunters" get the lowdown on DFing in the Appalachians with Joe Moell, KØOV’s, report from the USA’s National Foxhunting Championships. And in “Easy Does It,” learn how to make a “mystery” resonant speaker using easy-to-find and inexpensive PVC pipe. “The Young Radio Amateur” columnist Carole Perry, WB2MGP, salutes some pillars of Scouting and amateur radio. Find out who’s behind the program’s success in the Colorado Rockies. In May’s “Trail-Friendly Radio,” CQ Plus Editor Richard Fisher sets the table for a couple of great outdoor operating events: ARRL Field Day in June and the Adventure Radio Society’s Flight of the Bumblebees in July. In “Monitoring,” as well, he invites listeners to take part in the CQ Monitoring Station program. Learn how to come on board and get your own station identification sign. Rob de Santos, K8RKD, monthly keeps tabs on “Trends in Technology.” May’s focus is on “Project 621B” – GPS to the max. Rounding out this month’s edition, we find the Krusty One – Kurt N. Sterba – explaining the radiation pattern of the dipole antenna in terms just about anyone can understand. You may want to pour a cup of coffee to go along with Kurt’s “Doughnuts to Doublets” treatise. Of course, CQ Plus touches on the sublime and the ridiculous each month in its “Washington Beat” and “Unwired” columns, respectively. 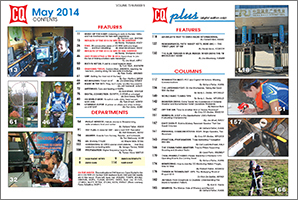 That's a brief look at what's coming up in the May issue of CQ magazine - including the digital-only CQ Plus - which should be available online as of May 1 and in subscribers' mailboxes in early-to-mid May, as we continue working toward getting back on our regular print schedule. We appreciate everyone's patience and loyalty as we have worked through these difficult past few months. 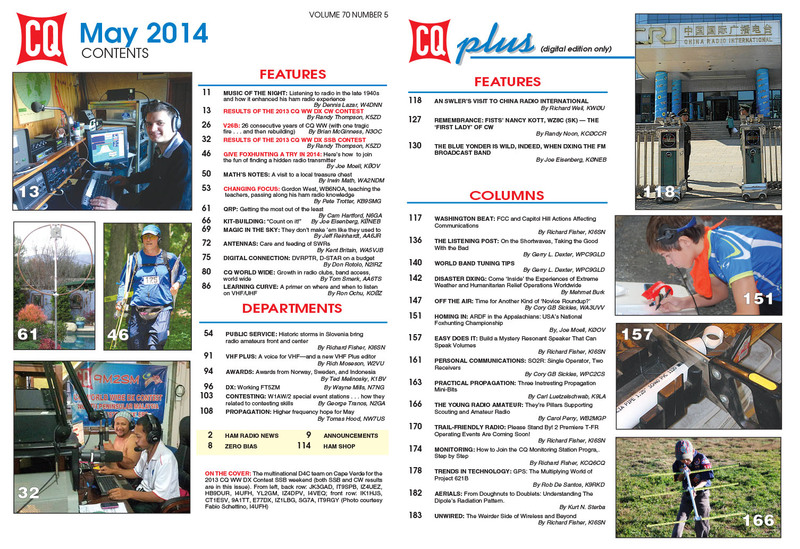 For information on becoming a CQ print or digital subscriber, click here! Zero Bias - "It Doesn't Get Much Better Than That!"